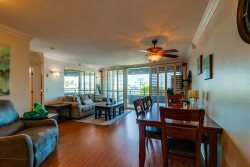 Spacious three bedroom and two bath fully equipped condo just steps to the beach in North Mission. This 1380 sqft upstairs beach getaway features high ceilings, saltillo tile floors, and carpeting in the bedrooms. Entering the condo you will step into the living room. The living room has a leather queen sofa sleeper, fireplace, 40 inch flat screen HD TV, DVD player, stereo, recliner, and club chair. 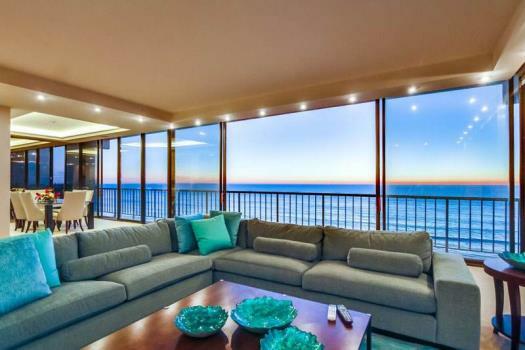 The balcony is off the living room and has views of the boardwalk, beach and ocean. Out on the balcony is a full size gas grill. The dining area is just across from the kitchen and has seating for 6, additional chairs available to seat more. Heading down the hallway towards the back on the condo will take you to the bedrooms. Also down the hallway there is a full size washer and dryer. The generous master suite has a California King bed, walk-in closet, dual sinks, jetted tub, and a 32 inch flat screen HD TV and DVD player. The second bedroom has three twin beds and a TV/DVD/VCR and the third bedroom has a queen bed, a 23 inch flat screen TV and DVD player and a bay view. The unit comes with cable TV and wireless internet. As you may be aware, parking in Mission Beach can be limited. This rental has parking for three cars - two in the garage and one behind the garage. The garage dimensions are 16 ft wide by 19 ft long and the parking behind the garage is 19 ft long by 7 ft wide. Please check your cars to see if they will fit. Outside under the stairs you will find a storage bin with beach toys and room to store bikes. You can also use the garage for secure storage. As you walk up Jersey Court towards the beach you will quickly approach the Mission Beach boardwalk and the beach. During the summer months there is a manned life guard station on the beach at Jersey Ct. This is a great beach location because in the summer heading to the South is a surfing only stretch of beach and heading to the North is a swimming/body board only stretch of beach so you have easy access to both. Very friendly, outgoing and warm! Enjoyed every minute of it. There were a few minor things that I reported when we left. These are common with the traffic that these places get. Slow drainage in the master bath in the left sink and window in the first bedroom on the right side would not open. You made check in and check out so quick and easy! The staff in your office are so pleasant. When we arrived at the Hideaway, there was no coffee maker. One phone call to your office and we had a brand new one delivered within the hour. We really enjoyed staying at the Hideaway! The location was perfect for us in regards to the beach and Belmont Park. There were plenty of beach chairs for us to use so we didn't even need to unpack ours. The grill on the deck was brand new and came in handy for our dinners in the evenings. The large garage for our cars was so nice. In the past, other units we have stayed in have had such tiny garages. The inside on the unit was very clean and well set up for our use.